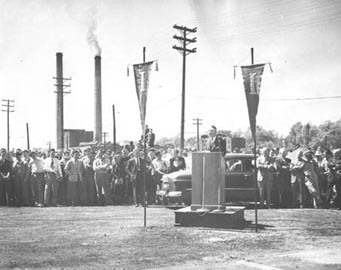 Approximately 3,000 people attended the ground breaking ceremonies on May 11, 1949. Today we break ground for the construction of the first library building as such this University of ours, in its one hundred and second year, has ever had. This is a day for which the University community has waited a long time, a very long time. When I came back to the University in the autumn of 1940, the budget for our legislative requests had already been prepared. In it was a request for the sum of $500,000 for the first unit of a $2,000,000 University library building (that is, $4,000,000 in today’s currency). In preparing for the presentation of this request for the General Assembly, I studied the history of this request for the General Assembly, I studied the history of the University’s prior requests for a library building. The first attempt was made exactly 50 years earlier – in the year 1891! That effort failed. I also found that when the building then known as the Natural Science building – and now known as Macbride Hall – was completed in 1904, it was decided that the library “should be temporarily housed therein.” And so for 45 years – amid the delightful aromas emanating from Home Economics, the alcoholic and moth ball scents from the Museum, the frightful racket from the orchestras practicing for Kampus Kapers and Panacea, the library has “temporarily housed itself therein.” I mention these facts to put at ease those persons – among whom are a few friends of mine, presidents of privately controlled institutions – who feel that the people of this state, through their elected representatives, proceed with unseemly haste to meet the needs of the state-supported institutions of higher learning!
. . . But when I have tried to state the three purposes this library is to serve – the liberal education of the youth, preservation of the records of learning, and advancement of research and teaching – there is something more that yearns to be said. One cannot contemplate libraries and books without recalling the civilization-long battle for the freedom of the human spirit. That is what yearns to be said on this occasion, because here we build a place for the magnificent record man has made in his quest for goodness, happiness and security. Over the shoulder of each reader peers the long line of men who have devoted their lives, and sometimes given their lives, to the end that just a little more may be known or felt. But all speak as men, to men and for mankind! In this confidence, let the work begin!